Terry Gene Bollea, better known by his ring name Hulk Hogan, is an American professional wrestler, actor, television personality, entrepreneur, and musician currently signed with WWE. Hogan enjoyed mainstream popularity in the 1980s and 1990s as the all-American character Hulk Hogan in the World Wrestling Federation (WWF, now WWE), and as "Hollywood" Hulk Hogan, the villainous nWo leader, in World Championship Wrestling (WCW). A regular pay-per-view headliner in both organizations, Hogan closed the respective premier annual events of the WWF and WCW, WrestleMania and Starrcade, on multiple occasions. He was inducted into the WWE Hall of Fame in 2005. He was signed with Total Nonstop Action Wrestling (TNA) from 2009 until 2013, where he was the on-screen General Manager. 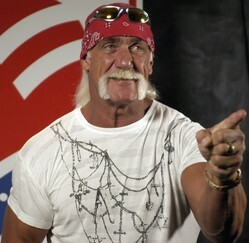 IGN described Hogan as "the most recognized wrestling star worldwide and the most popular wrestler of the '80s". Hulk Hogan is a 12-time World Champion being a six-time WWF/WWE World Heavyweight Champion and six-time WCW World Heavyweight Champion. He is the third longest combined reigning WWF Champion of all time (after Bruno Sammartino, and Bob Backlund), the longest-reigning champion of the 1980s, and holds two of the ten longest title runs in WWF/E history, having held the title for 1,474 days from 1984-1988 (the fourth longest reign of all time) and 364 days from 1989 to 1990 (the 9th longest reign of all time). He is also the longest-reigning WCW World Heavyweight Champion of all time, with a 469-day reign from 1994-1995. Hogan won the Royal Rumble in 1990 and 1991, making him the first man to win two consecutive Royal Rumbles.